When the Republicans failed to eliminate taxpayer money to NPR a/k/a National Palestinian Radio and Planned Parenthood, I decried it on this site. One of those you can thank for this is new Congressman Justin Amash, a Republican from Michigan who enjoyed Tea Party support. He just couldn’t bring himself to vote against those, and his reasoning is as stupid as they come. More on that below. As you’ll recall, I wrote about Amash and how he campaigned on, among other things, “a Palestinian state with contiguous borders,” meaning that Gaza and the so-called West Bank should be connected via more usurpation of Israeli land, Israeli homes, Israeli farms, and Israeli property. That’s no surprise, given that Amash brags of his Palestinian and Syrian Arab heritage and belongs to the anti-Israel Orthodox Church. But Amash, a career politician and spoiled rich kid–whose family spent hundreds of thousands of dollars to get him elected, has shown he’s just as much of a putz on domestic policy as he is on foreign policy. In the last three months, nearly 20 members have availed themselves of a “present” or two over the course of about 272 votes. Then there’s Justin Amash, the newly elected, 30-year-old west Michigan Republican fresh from one term in the state House. He has had 17 “present” votes . . . . They’ve come on votes big and small — on measures to strip federal funding for National Public Radio, for instance, or to slash money to Planned Parenthood. are unconstitutional because they single out the organizations. “It’s not saying, ‘We don’t like subsidizing speech,’ it’s saying, ‘We don’t like subsidizing NPR,’ ” he said. HUH?! Absurd. Virtually every single piece of legislation considered by Congress singles out organizations. How the heck does he think that NPR and Planned Parenthood got taxpayer money in the first place, and not, say, conservative websites and pro-life organizations. Did Amash stop to think for a second that by his same reasoning it might be unconstitutional, in the first place, to single out NPR and Planned Parenthood–two organizations with obvious left-wing agendas–to specifically receive money from the federal government as items in the budget? This dumbass behavior has garnered Amash kudos from the liberal New York Times, including a gushing piece the newspaper of record did on him. Shocker. I’m all for Republicans courting the young, as they are the future of the country and tending more and more liberal (and stupid). But it’s no coincidence that this jerk, Amash, is the second youngest Congressman currently serving. Younger elected officials who’ve never had a real job in their lives are the worst elected officials and the most out of touch. That’s definitely the case with Justin Amash, a guy who can’t bring himself to “single out” Planned Parenthood and NPR for an end to government funding, when they were singled out to get it in the first place. 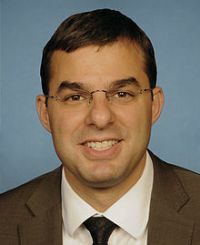 You know what DS and everybody else on this site, this dude, Justin Amash is about the same age as me (his age is 30 as Schlussel pointed out). Your right Debbie, the young politicans who are in their prime years (like me and Mr. Amash) NEVER had a real job in their lives (just like Obama) and tend to be out of touch on what’s really happening around them. As for the Tea Partiers, question, why the hell are they supporting this guy, he happens to be pro-Palestinian, pro-Islamic, & anti-Isreal don’t see who this guy really is? Didn’t the top people in the TPM acknowledged his records and exactly where he stands? As DS also pointed out on this article, Justin Amash is also pro-NPR and pro-Planned Parenthood (the founder of that organization in her day made all sorts of belitting and racist comments about black people and said that blacks should be eradicated from civilization, etc.). BTW, speaking of the TPM (I don’t mean to harp on them and get on their case but it’s what I see and learning) how come they didn’t have their rallies a few weeks ago? Or if they had rallies, how come the media didn’t report it? Debbie and everybody else, it’s not just the GOP and islamist front groups who are co-opting the TPM, but from what I’ve heard, their have been a few conservative talk show host and some conservative bloggers (not Debbie Schlussel) who are also co-opting the movement (for instance, Andrew Breitbart)! 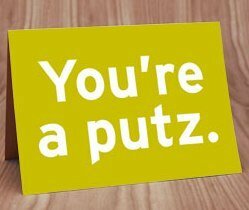 Yeah, Putz is right. This post reminded me of past posts where you highlighted the faux Republican Mooooooslims who try to get power within the Republican party in Michigan when all they really are ARE anti-American scum using the GOP so they can do even more damage. Oh, and the GOP establishment are doing lots of damage these days. Look at how “effective” those phonies (read LIBERAL) like Boehner and Issa are. The TPM better get hip to the establishment trip of the Liberal Republicans trying to gerrymander some of them out of office. Types like those and the Putz here you highlighted (a pro-Mooooslim faux Conservative) should keep the TPM on their toes. I didn’t go to the tax day rally this year (after attending 4 previous events) because I have more homework to do on the movement. Like, the two examples I talked about above. Amash is a fake, and should be made a one termer, if there is no recall mechanism in Michigan. Also, his position regarding government funding of organizations is so transparently specious that one has to assume that Mr. Amash is either quite the dullard or a very poor liar. Using his illogic, if the federal government decided to fund an organization at one point in time, it could not legitimately terminate such funding in the the future no matter how the organization performed. I am certain that Raytheon and General Electric would gleefully support such a stance. Ah ha ha ha! Good entertainment. As a West Michigander, I’m proud of the work Justin Amash has done and look forward to what the future has in store for him. The country needs more principled putzes like him in office. I am from W Michigan, and I voted for Hardiman. His being anti-Semitic is a reason he shouldn’t be allowed in the Republican Party. Amash is awesome. He is one of four people in Congress that actually abide by their oath of office (to defend the U.S. Constitution) when casting their votes. The others are Mike Lee (Utah), Rand Paul (Kentucky), and Ron Paul (Texas). We do not need camelions in our congress. We need people who speak with one tomgue and who think with one brain not people who weave between all the choices he can exploit. Let him be one termer. Thank God the house term is two years only. Seems like Ms. Schlussel is more worried about Israel then about the United States and her otherwise Constitutional Conservative values. I think it is a case of “Amash knows too much” considering that his father was actually displaced from his home in 1948, a fact that Schlussel would try and cover up. Despite this, Amash has been very accommodating to AIPAC and the usual “Israel First” crowd. Still, this is not good enough for Schlussel. If he was in the usual Israel first crowd he would not be supporting Ron Paul. May many more Orthodox Christians join him in congress!!! Many many many many more. I find it wildly ironic that a Jew is bringing up the subject of duel loyalties. You’re really going after him for being a member of “the” Orthodox Church? How is that any different from going after somebody for being Jewish? Amash is in fact very moderate on the Israel-Palestine conflict, and has unequivocally supported Israel’s right to its security. The East won’t have peace until Israel has been returned to the Palestinians, and Jerusalem has become a Crusader State under the protection of Her Majesty Queen Elizabeth II. Leave a Reply for J.T.